Vitamin D refers to a group of fat-soluble secosteroids responsible for enhancing intestinal absorption of calcium, iron, magnesium, phosphate and zinc. In humans, the most important compounds in this group are vitamin D3 (also known as cholecalciferol) and vitamin D2 (ergocalciferol). Cholecalciferol and ergocalciferol can be ingested from the diet and from supplements. The body can also synthesize vitamin D (specifically cholecalciferol) in the skin, from cholesterol, when sun exposure is adequate (hence its nickname, the "sunshine vitamin"). Synthesis from exposure to sunlight and intake from the diet generally contribute to the maintenance of adequate serum concentrations. Evidence indicates the synthesis of vitamin D from sun exposure is regulated by a negative feedback loop that prevents toxicity, but because of uncertainty about the cancer risk from sunlight, no recommendations are issued by the Institute of Medicine, USA, for the amount of sun exposure required to meet vitamin D requirements. Accordingly, the Dietary Reference Intake for vitamin D assumes no synthesis occurs and all of a person's vitamin D is from food intake, although that will rarely occur in practice. As vitamin D is synthesized in adequate amounts by most mammals exposed to sunlight, it is not strictly a vitamin, and may be considered a hormone as its synthesis and activity occur in different locations. Its discovery was due to effort to find the dietary substance lacking in rickets (the childhood form of osteomalacia). In the liver, cholecalciferol (vitamin D3) is converted to calcidiol, which is also known as calcifediol (INN), 25-hydroxycholecalciferol, or 25-hydroxyvitamin D3 — abbreviated 25(OH)D3. Ergocalciferol (vitamin D2) is converted in the liver to 25-hydroxyergocalciferol, also known as 25-hydroxyvitamin D2 — abbreviated 25(OH)D2. These two specific vitamin D metabolites are measured in serum to determine a person's vitamin D status. Part of the calcidiol is converted by the kidneys to calcitriol, the biologically active form of vitamin D. Calcitriol circulates as a hormone in the blood, regulating the concentration of calcium and phosphate in the bloodstream and promoting the healthy growth and remodeling of bone. Calcitriol also affects neuromuscular and immune function. The effects of vitamin D supplementation on health are uncertain. A 2013 review did not find any effect from supplementation on the rates of disease, other than a tentative decrease in mortality in the elderly. Low vitamin D levels may result from disease rather than cause disease. A United States Institute of Medicine (IOM) report states: "Outcomes related to cancer, cardiovascular disease and hypertension, and diabetes and metabolic syndrome, falls and physical performance, immune functioning and autoimmune disorders, infections, neuropsychological functioning, and preeclampsia could not be linked reliably with calcium or vitamin D intake and were often conflicting. ":5 Some researchers claim the IOM was too definitive in its recommendations and made a mathematical mistake when calculating the blood level of vitamin D associated with bone health. Members of the IOM panel maintain that they used a "standard procedure for dietary recommendations" and that the report is solidly based on the data. Research on vitamin D supplements, including large-scale clinical trials, is continuing. Vitamin D3 supplementation has been tentatively found to lead to a reduced risk of death in the elderly, but the effect has not been deemed pronounced or certain enough to make taking supplements recommendable. In general, no good evidence supports the commonly held belief that vitamin D supplements can help prevent osteoporosis. Its general use for prevention of this disease in those without vitamin D deficiency is thus likely not needed. For older people with osteoporosis, taking vitamin D with calcium may help prevent hip fractures, but it also slightly increases the risk of stomach and kidney problems. Supplementation with higher doses of vitamin D, in those older than 65 years, may decrease fracture risk. This appears to apply more to people in institutions than those living independently. Vitamin D deficiency causes osteomalacia (called rickets when it occurs in children). Use of vitamin D in children with normal vitamin D levels does not appear to improve bone density. Beyond that, low serum vitamin D levels have been associated with falls, and low bone mineral density. Taking extra vitamin D; however, does not appear to change the risk. Vitamin D supplements have been widely marketed on the internet and elsewhere for their claimed anticancer properties, but taking vitamin D supplements has been found to have no significant effect on cancer risk. Some research has suggested that vitamin D3 decreases the risk of death from cancer, but concerns with the quality of the data were noted. Insufficient evidence exists to recommend vitamin D to be prescribed for people with cancer, although some evidence suggests hypovitaminosis D may be associated with a worse outcome for some cancers, and that higher 25-hydroxy vitamin D levels at the time of diagnosis are associated with better outcomes. Taking vitamin D supplements does not meaningfully reduce the risk of stroke, cerebrovascular disease, cardial infarction, or ischaemic heart disease. Clinical trials of vitamin D supplementation for depressive symptoms have generally been of low quality and show no overall effect, although subgroup analysis showed supplementation for participants with clinically significant depressive symptoms or depressive disorder had a moderate effect. A systematic review of clinical studies shows an association between low vitamin D levels, cognitive impairment, and a higher risk of developing Alzheimer's disease. However, lower vitamin D concentrations is also associated with poor nutrition and spending less time outdoors. Therefore alternative explanations for the increase in cognitive impairment exist and hence a direct causal relationship between vitamin D levels and cognition could not be established. In general, vitamin D functions to activate the innate and dampen the adaptive immune systems. Deficiency has been linked to increased risk of viral infections, including HIV and influenza. Low levels of vitamin D appear to be a risk factor for tuberculosis, and historically it was used as a treatment. Although tentative data link low levels of vitamin D to asthma, evidence to support a beneficial effect from supplementation is inconclusive . Accordingly, supplementation is not currently recommended for treatment or prevention of asthma. Vitamin D hypovitaminosis may be a risk factor for multiple sclerosis, but no evidence indicates vitamin D has any clinically significant benefit as a treatment. Low levels of vitamin D in pregnancy are associated with gestational diabetes, pre-eclampsia, and small infants. The benefit of supplements, however, is unclear. Pregnant women who take an adequate amount of vitamin D during gestation may experience positive immune effects. Pregnant women often do not take the recommended amount of vitamin D.
Rickets, a childhood disease, is characterized by impeded growth and soft, weak, deformed long bones that bend and bow under their weight as children start to walk. This condition is characterized by bow legs, which can be caused by calcium or phosphorus deficiency, as well as a lack of vitamin D; today, it is largely found in low-income countries in Africa, Asia, or the Middle East and in those with genetic disorders such as pseudovitamin D deficiency rickets. Rickets was first described in 1650 by Francis Glisson, who said it had first appeared about 30 years previously in the counties of Dorset and Somerset. In 1857, John Snow suggested rickets, then widespread in Britain, was being caused by the adulteration of bakers' bread with alum. The role of diet in the development of rickets was determined by Edward Mellanby between 1918–1920. Nutritional rickets exists in countries with intense year-round sunlight such as Nigeria and can occur without vitamin D deficiency. Although rickets and osteomalacia are now rare in Britain, outbreaks have happened in some immigrant communities in which osteomalacia sufferers included women with seemingly adequate daylight outdoor exposure wearing Western clothing. Having darker skin and reduced exposure to sunshine did not produce rickets unless the diet deviated from a Western omnivore pattern characterized by high intakes of meat, fish, and eggs, and low intakes of high-extraction cereals. The dietary risk factors for rickets include abstaining from animal foods. Vitamin D deficiency remains the main cause of rickets among young infants in most countries, because breast milk is low in vitamin D and social customs and climatic conditions can prevent adequate sun exposure. In sunny countries such as Nigeria, South Africa, and Bangladesh, where the disease occurs among older toddlers and children, it has been attributed to low dietary calcium intakes, which are characteristic of cereal-based diets with limited access to dairy products. Rickets was formerly a major public health problem among the US population; in Denver, where ultraviolet rays are about 20% stronger than at sea level on the same latitude, almost two-thirds of 500 children had mild rickets in the late 1920s. An increase in the proportion of animal protein in the 20th century American diet coupled with increased consumption of milk fortified with relatively small quantities of vitamin D coincided with a dramatic decline in the number of rickets cases. Also, in the United States and Canada, vitamin D-fortified milk, infant vitamin supplements, and vitamin supplements have helped to eradicate the majority of cases of rickets for children with fat malabsorption conditions. Osteomalacia is a disease in adults that results from vitamin D deficiency. Characteristics of this disease are softening of the bones, leading to bending of the spine, bowing of the legs, proximal muscle weakness, bone fragility, and increased risk for fractures. Osteomalacia reduces calcium absorption and increases calcium loss from bone, which increases the risk for bone fractures. Osteomalacia is usually present when 25-hydroxyvitamin D levels are less than about 10 ng/mL. The effects of osteomalacia are thought to contribute to chronic musculoskeletal pain, There is no persuasive evidence of lower vitamin D levels in chronic pain sufferers. Some research shows dark-skinned people living in temperate climates have lower vitamin D levels. Dark-skinned people may be less efficient at making vitamin D because melanin in the skin hinders vitamin D synthesis; however, a recent study has found novel evidence that low vitamin D levels among Africans may be due to other reasons. Recent evidence implicates parathyroid hormone in adverse cardiovascular outcomes. Black women have an increase in serum parathyroid hormone at a lower 25(OH)D level than white women. A large-scale association study of the genetic determinants of vitamin D insufficiency in Caucasians found no links to pigmentation. However, the uniform occurrence of low serum 25(OH)D in Indians living in India and Chinese in China, does not support the hypothesis that the low levels seen in the more pigmented are due to lack of synthesis from the sun at higher latitudes. The leader of the study has urged dark-skinned immigrants to take vitamin D supplements nonetheless, saying, "I see no risk, no downside, there's only a potential benefit." Vitamin D toxicity is rare. The threshold for vitamin D toxicity has not been established; however, the tolerable upper intake level (UL) is 4,000 IU/day for ages 9–71. Vitamin D toxicity is not caused by sunlight exposure, but can be caused by supplementing with high doses of vitamin D. In healthy adults, sustained intake of more than 1250 μg/day (50,000 IU) can produce overt toxicity after several months and can increase serum 25-hydroxyvitamin D levels to 150 ng/ml and greater; those with certain medical conditions, such as primary hyperparathyroidism, are far more sensitive to vitamin D and develop hypercalcemia in response to any increase in vitamin D nutrition, while maternal hypercalcemia during pregnancy may increase fetal sensitivity to effects of vitamin D and lead to a syndrome of mental retardation and facial deformities. Hypercalcemia is a strong indication of vitamin D toxicity, noted with an increase in urination and thirst. If hypercalcemia is not treated, it results in excess deposits of calcium in soft tissues and organs such as the kidneys, liver, and heart, resulting in pain and organ damage. Pregnant or breastfeeding women should consult a doctor before taking a vitamin D supplement. The FDA advised manufacturers of liquid vitamin D supplements that droppers accompanying these products should be clearly and accurately marked for 400 international units (IU). In addition, for products intended for infants, the FDA recommends the dropper hold no more than 400 IU. For infants (birth to 12 months), the tolerable upper limit (maximum amount that can be tolerated without harm) is set at 25 μg/day (1,000 IU). One thousand micrograms per day in infants has produced toxicity within one month. After being commissioned by the Canadian and American governments, the Institute of Medicine (IOM) as of 30 November 2010, has increased the tolerable upper limit (UL) to 2,500 IU per day for ages 1–3 years, 3,000 IU per day for ages 4–8 years and 4,000 IU per day for ages 9–71+ years (including pregnant or lactating women). Vitamin D overdose causes hypercalcemia, and the main symptoms of vitamin D overdose are those of hypercalcemia: anorexia, nausea, and vomiting can occur, frequently followed by polyuria, polydipsia, weakness, insomnia, nervousness, pruritus, and, ultimately, renal failure. Proteinuria, urinary casts, azotemia, and metastatic calcification (especially in the kidneys) may develop. Other symptoms of vitamin D toxicity include mental retardation in young children, abnormal bone growth and formation, diarrhea, irritability, weight loss, and severe depression. Vitamin D toxicity is treated by discontinuing vitamin D supplementation and restricting calcium intake. Kidney damage may be irreversible. Exposure to sunlight for extended periods of time does not normally cause vitamin D toxicity. Within about 20 minutes of ultraviolet exposure in light-skinned individuals (three to six times longer for pigmented skin), the concentrations of vitamin D precursors produced in the skin reach an equilibrium, and any further vitamin D produced is degraded. Published cases of toxicity involving hypercalcemia in which the vitamin D dose and the 25-hydroxy-vitamin D levels are known all involve an intake of ≥40,000 IU (1,000 μg) per day. Recommending supplementation, when those supposedly in need of it are labeled healthy, has proved contentious, and doubt exists concerning long term effects of attaining and maintaining high serum 25(OH)D by supplementation. 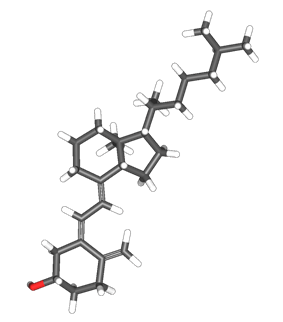 cholecalciferol (made from 7-dehydrocholesterol in the skin). Several forms (vitamers) of vitamin D exist. The two major forms are vitamin D2 or ergocalciferol, and vitamin D3 or cholecalciferol; vitamin D without a subscript refers to either D2 or D3 or both. These are known collectively as calciferol. Vitamin D2 was chemically characterized in 1931. In 1935, the chemical structure of vitamin D3 was established and proven to result from the ultraviolet irradiation of 7-dehydrocholesterol. 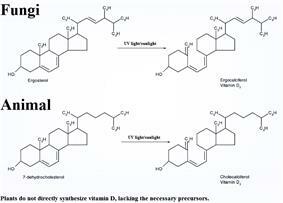 Vitamin D3 (cholecalciferol) is produced through the action of ultraviolet irradiation (UV) on its precursor 7-dehydrocholesterol. Human skin makes vitamin D3 and supplies about 90% of vitamin D. This molecule occurs naturally in the skin of animals and in milk. Vitamin D3 can be made by exposure of the skin to UVB, or by exposing milk directly to UV (one commercial method). Vitamin D3 is also found in oily fish and cod liver oil. Vitamin D2 is a derivative of vertebrates, because they lack the precursor ergosterol. The biological fate for producing 25(OH)D from vitamin D2 is expected to be the same as for 25(OH)D3, although some controversy exists over whether or not D2 can fully substitute for vitamin D3 in the human diet. Photosynthesis of vitamin D in the ocean by phytoplankton (such as coccolithophore and Emiliania huxleyi) has existed for more than 500 million years and continues to the present. Although primitive vertebrates in the ocean could absorb calcium from the ocean into their skeletons and eat plankton rich in vitamin D, land animals required another way to satisfy their vitamin D requirement for a calcified skeleton without relying on plants. Land vertebrates have been making their own vitamin D for more than 350 million years. Vitamin D can be synthesized only by a photochemical process, so land vertebrates had to ingest foods that contained vitamin D or had to be exposed to sunlight to photosynthesize vitamin D in their skin to satisfy their vitamin D requirements. 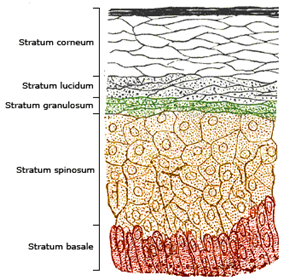 In the epidermal strata of the skin, production is greatest in the stratum basale (colored red in the illustration) and stratum spinosum (colored light brown). Vitamin D3 is produced photochemically in the skin from 7-dehydrocholesterol. The precursor of vitamin D3, 7-dehydrocholesterol is produced in relatively large quantities, 10,000 to 20,000 IU of vitamin D are produced in 30 minutes of whole-body exposure, in the skin of most vertebrate animals, including humans. 7-Dehydrocholesterol reacts with UVB light at wavelengths between 270 and 300 nm, with peak synthesis occurring between 295 and 297 nm. These wavelengths are present in sunlight, as well as in the light emitted by the UV lamps in tanning beds (which produce ultraviolet primarily in the UVA spectrum, but typically produce 4% to 10% of the total UV emissions as UVB). Vitamin D3 can be made in the skin. Exposure to light through windows is insufficient because glass almost completely blocks UVB light. Depending on the intensity of UVB rays and the minutes of exposure, an equilibrium can develop in the skin, and vitamin D degrades as fast as it is generated. The skin consists of two primary layers: the inner layer called the dermis, composed largely of connective tissue, and the outer, thinner epidermis. Thick epidermis in the soles and palms consists of five strata; from outer to inner, they are: the stratum corneum, stratum lucidum, stratum granulosum, stratum spinosum, and stratum basale. Vitamin D is produced in the two innermost strata, the stratum basale and stratum spinosum. The naked mole-rat appears to be naturally cholecalciferol-deficient, as serum 25-OH vitamin D levels are undetectable. In some animals, the presence of fur or feathers blocks the UV rays from reaching the skin. In birds and fur-bearing mammals, vitamin D is generated from the oily secretions of the skin deposited onto the feathers or fur and is obtained orally during grooming. Sunscreen absorbs ultraviolet light and prevents it from reaching the skin. Sunscreen with a sun protection factor (SPF) of 8 based on the UVB spectrum has been reported to decrease vitamin D synthetic capacity by 95%, whereas sunscreen with an SPF of 15 can reduce synthetic capacity by 98%. Calcium regulation in the human body. The role of vitamin D is shown in orange. Vitamin D is carried in the bloodstream to the liver, where it is converted into the  In addition to the kidneys, calcitriol is also synthesized by monocyte-macrophages in the immune system. When synthesized by monocyte-macrophages, calcitriol acts locally as a cytokine, defending the body against microbial invaders by stimulating the innate immune system. Whether it is made in the skin or ingested, cholecalciferol is hydroxylated in the liver at position 25 (upper right of the molecule) to form 25-hydroxycholecalciferol (calcidiol or 25(OH)D). This reaction is catalyzed by the microsomal enzyme vitamin D 25-hydroxylase, which is produced by hepatocytes. Once made, the product is released into the plasma, where it is bound to an α-globulin, vitamin D-binding protein. Calcidiol is transported to the proximal tubules of the kidneys, where it is hydroxylated at the 1-α position (lower right of the molecule) to form calcitriol (1,25-dihydroxycholecalciferol and abbreviated to 1,25(OH)2D). This product is a potent ligand of the vitamin D receptor, which mediates most of the physiological actions of the vitamin. The conversion of calcidiol to calcitriol is catalyzed by the enzyme 25-hydroxyvitamin D3 1-alpha-hydroxylase, the levels of which are increased by parathyroid hormone (and additionally by low calcium or phosphate). The active vitamin D metabolite calcitriol mediates its biological effects by binding to the brain, heart, skin, gonads, prostate, and breast. VDR activation in the intestine, bone, kidney, and parathyroid gland cells leads to the maintenance of calcium and phosphorus levels in the blood (with the assistance of parathyroid hormone and calcitonin) and to the maintenance of bone content. One of the most important roles of vitamin D is to maintain skeletal calcium balance by promoting calcium absorption in the intestines, promoting bone resorption by increasing osteoclast number, maintaining calcium and phosphate levels for bone formation, and allowing proper functioning of parathyroid hormone to maintain serum calcium levels. Vitamin D deficiency can result in lower bone mineral density and an increased risk of reduced bone density (osteoporosis) or bone fracture because a lack of vitamin D alters mineral metabolism in the body. Thus, although it may initially appear paradoxical, vitamin D is also critical for bone remodeling through its role as a potent stimulator of bone resorption. The VDR is known to be involved in cell proliferation and differentiation. Vitamin D also affects the immune system, and VDRs are expressed in several white blood cells, including monocytes and activated T and B cells. Vitamin D increases expression of the tyrosine hydroxylase gene in adrenal medullary cells. It also is involved in the biosynthesis of neurotrophic factors, synthesis of nitric oxide synthase, and increased glutathione levels. Apart from VDR activation, various alternative mechanisms of action are known. An important one of these is its role as a natural inhibitor of signal transduction by hedgehog (a hormone involved in morphogenesis). American researchers Elmer McCollum and Marguerite Davis in 1914 discovered a substance in cod liver oil which later was called "vitamin A". British doctor Edward Mellanby noticed dogs that were fed cod liver oil did not develop rickets and concluded vitamin A, or a closely associated factor, could prevent the disease. In 1922, Elmer McCollum tested modified cod liver oil in which the vitamin A had been destroyed. The modified oil cured the sick dogs, so McCollum concluded the factor in cod liver oil which cured rickets was distinct from vitamin A. He called it vitamin D because it was the fourth vitamin to be named. It was not initially realized that, unlike other vitamins, vitamin D can be synthesised by humans through exposure to UV light. In 1925, it was established that when 7-dehydrocholesterol is irradiated with light, a form of a fat-soluble vitamin is produced (now known as D3). Alfred Fabian Hess stated, "light equals vitamin D." Adolf Windaus, at the University of Göttingen in Germany, received the Nobel Prize in Chemistry in 1928 for his work on the constitution of sterols and their connection with vitamins. In 1929, a group at NIMR in Hampstead, London, were working on the structure of vitamin D, which was still unknown, as well as the structure of steroids. A meeting took place with J.B.S. Haldane, J.D. Bernal and Dorothy Crowfoot to discuss possible structures, which contributed to bringing a team together. X-ray crystallography demonstrated the sterol molecules were flat, not as proposed by the German team led by Windaus. In 1932, Otto Rosenheim and Harold King published a paper putting forward structures for sterols and bile acids which found immediate acceptance. The informal academic collaboration between the team members Robert Benedict Bourdillon, Otto Rosenheim, Harold King, and Kenneth Callow was very productive and led to the isolation and characterization of vitamin D. At this time, the policy of the Medical Research Council was not to patent discoveries, believing the results of medical research should be open to everybody. In the 1930s, Windaus clarified further the chemical structure of vitamin D.
In 1923, American biochemist  After irradiating rodent food, Steenbock discovered the rodents were cured of rickets. A vitamin D deficiency is a known cause of rickets. Using $300 of his own money, Steenbock patented his invention. His irradiation technique was used for foodstuffs, most memorably for milk. By the expiration of his patent in 1945, rickets had been all but eliminated in the US. In 1971–72, the further metabolism of vitamin D to active forms was discovered. In the liver, vitamin D was found to be converted to calcidiol. Part of the calcidiol is then converted by the kidneys to calcitriol, the biologically active form of vitamin D. Calcitriol circulates as a hormone in the blood, regulating the concentration of calcium and phosphate in the bloodstream and promoting the healthy growth and remodeling of bone. Both calcidiol and calcitriol were identified by a team led by Michael F. Holick in the laboratory of Hector DeLuca. Different institutions propose different recommendations concerning daily amounts of the vitamin. Commonly recommended daily intake of vitamin D is not sufficient if sunlight exposure is limited. The recommended daily amount for vitamin D in the European Union is 5 µg. The European Menopause and Andropause Society recommended 15 µg (600 IU) until age 70, and 20 µg (800 IU) in older than 71 years, in postmenopausal women. This dose should be increased to 4,000 IU/day in some patients with very low vitamin D status or in case of comorbid conditions. The UK National Health Service recommends babies and young children aged six months to five years, pregnant or breastfeeding women, and sun-deprived elderly people should take daily vitamin supplements to ensure sufficient vitamin D intake; the general population gets enough vitamin D from good diets and from sunlight. Asterisk for infants indicates adequate intake (AI) for infants, as an RDA has yet to be established for infants. One school of thought contends the human physiology is fine-tuned to an intake of 4,000–12,000 IU/day from sun exposure with concomitant serum 25-hydroxyvitamin D levels of 40 to 80 ng/ml and this is required for optimal health. Proponents of this view, who include some members of the panel that drafted a now-superseded 1997 report on vitamin D from the IOM, contend the IOM's warning about serum concentrations above 50 ng/ml lacks biological plausibility. They suggest, for some people, reducing the risk of preventable disease requires a higher level of vitamin D than that recommended by the IOM. US labs generally report 25(OH)D levels as ng/ml. Other countries often use nmol/l. An IOM committee concluded a serum 25-hydroxyvitamin D level of 20 ng/ml (50 nmol/l) is desirable for bone and overall health. The dietary reference intakes for vitamin D are chosen with a margin of safety and 'overshoot' the targeted serum value to ensure the specified levels of intake achieve the desired serum 25-hydroxyvitamin D levels in almost all persons. No contributions to serum 25-hydroxyvitamin D level are assumed from sun exposure and the recommendations are fully applicable to people with dark skin or negligible exposure to sunlight. The Institute found serum 25-hydroxyvitamin D concentrations above 30 ng/ml (75 nmol/l) are "not consistently associated with increased benefit". Serum 25-hydroxyvitamin D levels above 50 ng/ml (125 nmol/l) may be cause for concern. However, the desired range of serum 25-hydroxyvitamin D is between 20 and 50 ng/ml. The risk of cardiovascular disease is lower when vitamin D ranged from 20 to 60 nmol/l (8 to 24 ng/ml). A "threshold effect" appears to occur once a level of 60 nmol/l (24 ng/ml) has been reached i.e., levels of vitamin D over 60 nmol/l did not show added benefit. Apart from the above discussion on health effects or scientific evidence for lowering disease risk, governmental regulatory agencies stipulate for the food industry health claims allowable as statements on packaging. Other possible agencies with claim guidance: Japan FOSHU and Australia-New Zealand. Vitamin D is found in few dietary sources. Sunlight exposure is the primary source of vitamin D for majority of people, other than supplements. Fungus, from USDA nutrient database (per 100 g): Low values in mushrooms for vitamin D below indicate incidental exposure to sunlight which activates synthesis of vitamin D2. When fresh mushrooms or dried powders are purposely exposed to artificial sunlight by use of an industrial ultraviolet lamp, vitamin D levels can be controlled at much higher levels. Vitamin D2, or ergocalciferol found in fungi, is synthesized from viosterol, which in turn is activated when ultraviolet light stimulates ergosterol. Human bioavailability of vitamin D2 from vitamin D2-enhanced button mushrooms via UV-B irradiation is effective in improving vitamin D status and not different from a vitamin D2 supplement. Vitamin D2 from UV-irradiated yeast baked into bread or mushrooms is bioavailable and increases blood levels of 25(OH)D.
By visual assessment or using a chromometer, no significant discoloration of irradiated mushrooms, as measured by the degree of "whiteness", was observed. Claims have been made that a normal serving (approx. 3 oz or 1/2 cup, or 60 grams) of fresh mushrooms treated with ultraviolet light have increased vitamin D content to levels up to 80 micrograms or 2700 IU if exposed to just 5 minutes of UV light after being harvested. Alfalfa (Medicago sativa subsp. sativa), shoot: 4.8 μg (192 IU) vitamin D2, 0.1 μg (4 IU) vitamin D3 (per 100 g). In some countries, staple foods are artificially fortified with vitamin D.
Cladina arbuscula specimens grown under different natural conditions: The contents of vitamin D3 range from 0.67 to 2.04 μg g⁻¹ dry matter in the thalli of C. arbuscula specimens grown under different natural conditions. Vitamin D3 (cholecalciferol) is produced industrially by exposing  or in wool grease (lanolin) from sheep. Vitamin D2 (ergocalciferol) is produced in a similar way using ergosterol from yeast or mushrooms as a starting material. ^ a b c d e f Holick MF (March 2006). "High prevalence of vitamin D inadequacy and implications for health". Mayo Clin. Proc. 81 (3): 353–73. ^ a b Calvo MS, Whiting SJ, Barton CN; Whiting; Barton (February 2005). "Vitamin D intake: a global perspective of current status". J. Nutr. 135 (2): 310–6. ^ a b c Norman AW (August 2008). "From vitamin D to hormone D: fundamentals of the vitamin D endocrine system essential for good health". Am. J. Clin. Nutr. 88 (2): 491S–499S. ^ a b c d Wolf G (June 2004). "The discovery of vitamin D: the contribution of Adolf Windaus". J Nutr 134 (6): 1299–302. ^ Pittas AG, Chung M, Trikalinos T, Mitri J, Brendel M, Patel K, Lichtenstein AH, Lau J, Balk EM; Chung; Trikalinos; Mitri; Brendel; Patel; Lichtenstein; Lau; Balk (Mar 2010). "Vitamin D and Cardiometabolic Outcomes: A Systematic Review". Annals of internal medicine 152 (5): 307–14. ^ a b Chung M, Balk EM, Brendel M, Ip S, Lau J, Lee J, Lichtenstein A, Patel K, Raman G, Tatsioni A, Terasawa T, Trikalinos TA; Balk; Brendel; Ip; Lau; Lee; Lichtenstein; Patel; Raman; Tatsioni; Terasawa; Trikalinos (August 2009). "Vitamin D and calcium: a systematic review of health outcomes". Evidence report/technology assessment (183): 1–420. ^ a b c d e f g h i j k l m n Ross AC, Taylor CL, Yaktine AL Del Valle HB (2011). Dietary Reference Intakes for Calcium and Vitamin D. Washington, D.C: National Academies Press. ^ a b c Bjelakovic G, Gluud LL, Nikolova D, Whitfield K, Wetterslev J, Simonetti RG, Bjelakovic M, Gluud C; Gluud; Nikolova; Whitfield; Wetterslev; Simonetti; Bjelakovic; Gluud (2014). "Vitamin D supplementation for prevention of mortality in adults". Cochrane Database Syst Rev (Systematic review) 1: CD007470. ^ a b c d e Bolland MJ, Grey A, Gamble GD, Reid IR (January 2014). "The effect of vitamin D supplementation on skeletal, vascular, or cancer outcomes: a trial sequential meta-analysis". Lancet Diabetes Endocrinol (Meta-analysis). ^ "Vitamin D Tests". Lab Tests Online (USA). American Association for Clinical Chemistry. Retrieved June 23, 2013. ^ a b Hollis BW (January 1996). "Assessment of vitamin D nutritional and hormonal status: what to measure and how to do it". Calcif. Tissue Int. 58 (1): 4–5. ^ a b c Holick MF, Schnoes HK, DeLuca HF, Suda T, Cousins RJ; Schnoes; Deluca; Suda; Cousins (1971). "Isolation and identification of 1,25-dihydroxycholecalciferol. A metabolite of vitamin D active in intestine". Biochemistry 10 (14): 2799–804. ^ a b "Dietary Supplement Fact Sheet: Vitamin D". Office of Dietary Supplements (ODS). ^ Theodoratou E, Tzoulaki I, Zgaga L, Ioannidis JP; Tzoulaki; Zgaga; Ioannidis (April 1, 2014). "Vitamin D and multiple health outcomes: umbrella review of systematic reviews and meta-analyses of observational studies and randomised trials". BMJ (Clinical research ed.) 348: g2035. ^ a b c Autier P, Boniol M, Pizot C, Mullie P; Boniol; Pizot; Mullie (December 2013). "Vitamin D status and ill health: a systematic review". The Lancet Diabetes & Endocrinology 2: 76. ^ a b Maxmen A (2011). "Nutrition advice: the vitamin D-lemma". Nature 475 (7354): 23–5. ^ Schöttker B, Jorde R, Peasey A, Thorand B, Jansen EH, Groot Ld, Streppel M, Gardiner J, Ordóñez-Mena JM, Perna L, Wilsgaard T, Rathmann W, Feskens E, Kampman E, Siganos G, Njølstad I, Mathiesen EB, Kubínová R, Pająk A, Topor-Madry R, Tamosiunas A, Hughes M, Kee F, Bobak M, Trichopoulou A, Boffetta P, Brenner H, B.; Jorde, R.; Peasey, A.; Thorand; Jansen; Groot; Streppel; Gardiner; Ordóñez-Mena; Perna; Wilsgaard; Rathmann; Feskens; Kampman; Siganos; Njølstad; Mathiesen; Kubínová; Pająk; Topor-Madry; Tamosiunas; Hughes; Kee; Bobak; Trichopoulou; Boffetta; Brenner; Consortium on Health Ageing: Network of Cohorts in Europe the United States (June 17, 2014). "Vitamin D and mortality: meta-analysis of individual participant data from a large consortium of cohort studies from Europe and the United States". BMJ 348 (jun17 16): g3656–g3656. ^ Tuohimaa P (March 2009). "Vitamin D and aging". The Journal of Steroid Biochemistry and Molecular Biology 114 (1–2): 78–84. ^ Tuohimaa P, Keisala T, Minasyan A, Cachat J, Kalueff A; Keisala; Minasyan; Cachat; Kalueff (2009). "Vitamin D, nervous system and aging". Psychoneuroendocrinology 34: S278–86. ^ Manya H, Akasaka-Manya K, Endo T; Akasaka-Manya; Endo (July 2010). "Klotho protein deficiency and aging". Geriatr Gerontol Int 10 (Suppl 1): S80–7. ^ Reid IR, Bolland MJ, Grey A; Bolland; Grey (January 11, 2014). "Effects of vitamin D supplements on bone mineral density: a systematic review and meta-analysis". Lancet 383 (9912): 146–55. ^ Avenell A, Gillespie WJ, Gillespie LD, O'Connell D (2009). Avenell, Alison, ed. "Vitamin D and vitamin D analogues for preventing fractures associated with involutional and post-menopausal osteoporosis". Cochrane Database Syst Rev (2): CD000227. ^ Bischoff-Ferrari HA, Willett WC, Orav EJ, Oray EJ, Lips P, Meunier PJ, Lyons RA, Flicker L, Wark J, Jackson RD, Cauley JA, Meyer HE, Pfeifer M, Sanders KM, Stähelin HB, Theiler R, Dawson-Hughes B (July 2012). "A pooled analysis of vitamin D dose requirements for fracture prevention". N. Engl. J. Med. 367 (1): 40–9. ^ Chung M, Lee J, Terasawa T, Lau J, Trikalinos TA (2011). "Vitamin D with or Without Calcium Supplementation for Prevention of Cancer and Fractures: An Updated Meta-analysis for the U.S. Preventive Services Task Force". Annals of internal medicine 155 (12): 827–38. ^ Winzenberg T, Powell S, Shaw KA, Jones G (2011). "Effects of vitamin D supplementation on bone density in healthy children: systematic review and meta-analysis". BMJ 342: c7254. ^ Cranney A, Horsley T, O'Donnell S, Weiler H, Puil L, Ooi D, Atkinson S, Ward L, Moher D, Hanley D, Fang M, Yazdi F, Garritty C, Sampson M, Barrowman N, Tsertsvadze A, Mamaladze V (August 2007). "Effectiveness and safety of vitamin D in relation to bone health". Evidence report/technology assessment (158): 1–235. ^ Bolland MJ, Grey A, Gamble GD, Reid IR (2014). "Vitamin D supplementation and falls: a trial sequential meta-analysis". Lancet Diabetes Endocrinol 2 (7): 573–80. ^ Byers T (July 2010). "Anticancer vitamins du Jour--The ABCED's so far". Am. J. Epidemiol. (Review) 172 (1): 1–3. ^ Bjelakovic G, Gluud LL, Nikolova D, Whitfield K, Wetterslev J, Simonetti RG, Bjelakovic M, Gluud C (January 10, 2014). "Vitamin D supplementation for prevention of mortality in adults.". The Cochrane database of systematic reviews 1: CD007470. ^ Buttigliero C, Monagheddu C, Petroni P, Saini A, Dogliotti L, Ciccone G, Berruti A (2011). "Prognostic role of vitamin d status and efficacy of vitamin d supplementation in cancer patients: a systematic review". The oncologist 16 (9): 1215–27. ^ Li M, Chen P, Li J, Chu R, Xie D, Wang H (2014). "Review: the impacts of circulating 25-hydroxyvitamin D levels on cancer patient outcomes: a systematic review and meta-analysis". J Clin Endocrinol Metab. Online first (7): 2327–36. ^ Shaffer JA, Edmondson D, Wasson LT, Falzon L, Homma K, Ezeokoli N, Li P, Davidson KW (2014). "Vitamin D Supplementation for Depressive Symptoms: A Systematic Review and Meta-Analysis of Randomized Controlled Trials". ^ Balion C, Griffith LE, Strifler L, Henderson M, Patterson C, Heckman G, Llewellyn DJ, Raina P (2012). "Vitamin D, cognition, and dementia: a systematic review and meta-analysis". Neurology 79 (13): 1397–405. ^ Hewison M (2011). "Vitamin D and innate and adaptive immunity". Vitam. Horm. Vitamins & Hormones 86: 23–62. ^ Beard JA, Bearden A, Striker R (Mar 2011). "Vitamin D and the anti-viral state". Journal of clinical virology : the official publication of the Pan American Society for Clinical Virology 50 (3): 194–200. ^ Spector SA (Feb 2011). "Vitamin D and HIV: letting the sun shine in". Topics in antiviral medicine 19 (1): 6–10. ^ Cannell JJ, Vieth R, Umhau JC, Holick MF, Grant WB, Madronich S, Garland CF, Giovannucci E (2006). "Epidemic influenza and vitamin D". Epidemiology and Infection 134 (6): 1129–40. ^ Nnoaham KE, Clarke A (Feb 2008). "Low serum vitamin D levels and tuberculosis: a systematic review and meta-analysis". International Journal of Epidemiology 37 (1): 113–9. ^ Luong Kv, Nguyen LT (Jun 2011). "Impact of vitamin D in the treatment of tuberculosis". The American journal of the medical sciences 341 (6): 493–8. ^ Hart PH (2012). "Vitamin D supplementation, moderate sun exposure, and control of immune diseases". Discovery Medicine 13 (73): 397–404. ^ Paul G, Brehm JM, Alcorn JF, Holguín F, Aujla SJ, Celedón JC (Jan 2012). "Vitamin D and asthma". American Journal of Respiratory and Critical Care Medicine 185 (2): 124–32. ^ Pierrot-Deseilligny C, Souberbielle JC (Jul 2010). "Is hypovitaminosis D one of the environmental risk factors for multiple sclerosis?". Brain : a journal of neurology 133 (Pt 7): 1869–88. ^ Pozuelo-Moyano B, Benito-León J, Mitchell AJ, Hernández-Gallego J (2013). "A systematic review of randomized, double-blind, placebo-controlled trials examining the clinical efficacy of vitamin D in multiple sclerosis". Neuroepidemiology (Systematic Review) 40 (3): 147–53. ^ a b Aghajafari F, Nagulesapillai T, Ronksley PE, Tough SC, O'Beirne M, Rabi DM (2013). "Association between maternal serum 25-hydroxyvitamin D level and pregnancy and neonatal outcomes: systematic review and meta-analysis of observational studies". BMJ 346: f1169. ^ a b Wagner CL, Taylor SN, Dawodu A, Johnson DD, Hollis BW (March 2012). "Vitamin D and its role during pregnancy in attaining optimal health of mother and fetus". Nutrients 4 (3): 208–30. ^ Eriksen EF, Glerup H (2002). "Vitamin D deficiency and aging: implications for general health and osteoporosis". Biogerontology 3 (1–2): 73–7. ^ a b c d e f g Holick MF (July 2007). "Vitamin D deficiency". N. Engl. J. Med. 357 (3): 266–81. ^ Schoenmakers I, Goldberg GR, Prentice A (2008). "Abundant sunshine and vitamin D deficiency". British Journal of Nutrition 99 (6): 1171–3. ^ Grant WB, Holick MF (2005). "Benefits and requirements of vitamin D for optimal health: a review". Alternative medicine review 10 (2): 94–111. ^ a b c d e Brown JE (2008). Nutrition through the life cycle. Belmont, CA: Thomson/Wadsworth. ^ Lerch C, Meissner T (2007). Lerch, Christian, ed. "Interventions for the prevention of nutritional rickets in term born children". Cochrane database of systematic reviews (Online) (4): CD006164. ^ Zargar AH, Mithal A, Wani AI, Laway BA, Masoodi SR, Bashir MI, Ganie MA (June 2000). "Pseudovitamin D deficiency rickets—a report from the Indian subcontinent". Postgraduate Medical Journal 76 (896): 369–72. ^ Gibbs D (1994). "Rickets and the crippled child: an historical perspective". Journal of the Royal Society of Medicine 87 (12): 729–32. ^ Dunnigan M (2003). "Commentary: John Snow and alum-induced rickets from adulterated London bread: an overlooked contribution to metabolic bone disease". International Journal of Epidemiology 32 (3): 340–1. ^ Pileggi VJ, De Luca HF, Steenbock H (September 1955). "The role of vitamin D and intestinal phytase in the prevention of rickets in rats on cereal diets". Archives of Biochemistry and Biophysics 58 (1): 194–204. ^ Ford JA, Colhoun EM, McIntosh WB, Dunnigan MG (1972). "Biochemical Response of Late Rickets and Osteomalacia to a Chupatty-free Diet". British Medical Journal 3 (5824): 446–7. ^ Rajakumar K (2003). "Vitamin D, cod-liver oil, sunlight, and rickets: a historical perspective". Pediatrics 112 (2): e132–5. ^ Oramasionwu GE, Thacher TD, Pam SD, Pettifor JM, Abrams SA (2008). "Adaptation of calcium absorption during treatment of nutritional rickets in Nigerian children". The British journal of nutrition 100 (2): 387–92. ^ Fischer PR, Rahman A, Cimma JP, Kyaw-Myint TO, Kabir AR, Talukder K, Hassan N, Manaster BJ, Staab DB, Duxbury JM, Welch RM, Meisner CA, Haque S, Combs GF (1999). "Nutritional rickets without vitamin D deficiency in Bangladesh". Journal of tropical pediatrics 45 (5): 291–3. ^ a b Dunnigan MG, Henderson JB (1997). "An epidemiological model of privational rickets and osteomalacia". The Proceedings of the Nutrition Society 56 (3): 939–56. ^ Robertson I, Ford JA, McIntosh WB, Dunnigan MG (1981). "The role of cereals in the aetiology of nutritional rickets: the lesson of the Irish National Nutrition Survey 1943–8". The British journal of nutrition 45 (1): 17–22. ^ Clements MR (1989). "The problem of rickets in UK Asians". Journal of Human Nutrition and Dietetics 2 (2): 105. ^ a b Pettifor JM (2004). "Nutritional rickets: deficiency of vitamin D, calcium, or both?". ^ a b Dunnigan MG, Henderson JB, Hole DJ, Barbara Mawer E, Berry JL (2007). "Meat consumption reduces the risk of nutritional rickets and osteomalacia". British Journal of Nutrition 94 (6): 983–91. ^ "US National Institutes Of Health, National Cancer Institute". Science.education.nih.gov. Retrieved August 24, 2010. ^ Weick MT (1967). "A history of rickets in the United States". ^ Garrison RH, Somer E (1997). The Nutrition Desk Reference. McGraw-Hill. ^ DuPuis EM (2002). Nature's Perfect Food: How Milk Became America's Drink. ^ Teegarden D, Lyle RM, Proulx WR, Johnston CC, Weaver CM (1999). "Previous milk consumption is associated with greater bone density in young women". ^ a b Holick MF (2004). "Sunlight and vitamin D for bone health and prevention of autoimmune diseases, cancers, and cardiovascular disease". ^ a b c Insel PM, Turner ER, Ross D (2006). Discovering nutrition (2nd ed.). Boston: Jones and Bartlett Publishers. ^ Holick MF (2003). "Vitamin D: A millenium perspective". ^ Stewart B. Leavitt. "Vitamin D – A Neglected 'Analgesic' for Chronic Musculoskeletal Pain". Pain-Topics.org. Retrieved March 25, 2009. ^ Straube S, Andrew Moore R, Derry S, McQuay HJ (2009). "Vitamin D and chronic pain". ^ Azmina Govindji RD (July 1, 2010). "When it's sunny, top up your vitamin D". TheIsmaili.org. Retrieved July 1, 2010. ^ a b Ford L, Graham V, Wall A, Berg J (November 2006). "Vitamin D concentrations in an UK inner-city multicultural outpatient population". Annals of Clinical Biochemistry 43 (6): 468–73. ^ Signorello LB, Williams SM, Zheng W, Smith JR, Long J, Cai Q, Hargreaves MK, Hollis BW, Blot WJ (2010). "Blood vitamin D levels in relation to genetic estimation of African ancestry". ^ Aloia JF, Chen DG, Chen H (2010). "The 25(OH)D/PTH Threshold in Black Women". The Journal of Clinical Endocrinology and Metabolism 95 (11): 5069–73. ^ Wang TJ, Zhang F, Richards JB, Kestenbaum B, van Meurs JB, Berry D, Kiel DP, Streeten EA, Ohlsson C, Koller DL, Peltonen L, Cooper JD, O'Reilly PF, Houston DK, Glazer NL, Vandenput L, Peacock M, Shi J, Rivadeneira F, McCarthy MI, Anneli P, de Boer IH, Mangino M, Kato B, Smyth DJ, Booth SL, Jacques PF, Burke GL, Goodarzi M, Cheung CL, Wolf M, Rice K, Goltzman D, Hidiroglou N, Ladouceur M, Wareham NJ, Hocking LJ, Hart D, Arden NK, Cooper C, Malik S, Fraser WD, Hartikainen AL, Zhai G, Macdonald HM, Forouhi NG, Loos RJ, Reid DM, Hakim A, Dennison E, Liu Y, Power C, Stevens HE, Jaana L, Vasan RS, Soranzo N, Bojunga J, Psaty BM, Lorentzon M, Foroud T, Harris TB, Hofman A, Jansson JO, Cauley JA, Uitterlinden AG, Gibson Q, Järvelin MR, Karasik D, Siscovick DS, Econs MJ, Kritchevsky SB, Florez JC, Todd JA, Dupuis J, Hyppönen E, Spector TD (2010). "Common genetic determinants of vitamin D insufficiency: a genome-wide association study". Lancet 376 (9736): 180–8. ^ Bouillon R (2010). "Genetic and environmental determinants of vitamin D status". Lancet 376 (9736): 148–9. ^ Harinarayan CV, Joshi SR (2009). "Vitamin D status in India—its implications and remedial measures". The Journal of the Association of Physicians of India 57: 40–8. ^ Lips P (2010). "Worldwide status of vitamin D nutrition". The Journal of Steroid Biochemistry and Molecular Biology 121 (1–2): 297–300. ^ CBC "Dark-skinned immigrants urged to take vitamin D". February 16, 2010. CBC News. ^ Stephen Strauss. "The vitamin D debate". February 13, 2008.CBC News. ^ a b c d Shaffer JA, Edmondson D, Wasson LT, Falzon L, Homma K, Ezeokoli N, Li P, Davidson KW (2014). "Vitamin D supplementation, 25-hydroxyvitamin D concentrations, and safety". ^ Tolerable Upper Intake Limits for Vitamins And Minerals (PDF). ^ DeLancey S (June 15, 2010). "FDA Cautions on Accurate Vitamin D Supplementation for Infants". Press Announcement. U.S. Food and Drug Administration. ^ a b Holick MF (March 1995). "Environmental factors that influence the cutaneous production of vitamin D" (PDF). ^ Tseng L, Brehm, JM, Alcorn, JF, Holguín, F, Aujla, SJ, Celedón, JC (2003). "Controversies in Vitamin D Supplementation". Nutrition Bytes 9 (1). ^ History of Vitamin D University of California, Riverside, Vitamin D Workshop. ^ a b Holick MF, Binkley NC, Bischoff-Ferrari HA, Gordon CM, Hanley DA, Heaney RP, Murad MH, Weaver CM (2011). "Evaluation, treatment, and prevention of vitamin D deficiency: an Endocrine Society clinical practice guideline". 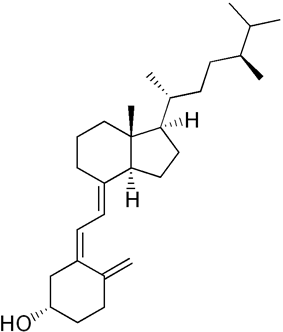 J Clin Endocrinol Metab 96 (7): 1911–30. ^ Houghton LA, Vieth R (October 2006). ) as a vitamin supplement"2"The case against ergocalciferol (vitamin D (PDF). ^ Holick MF, Biancuzzo RM, Chen TC, Klein EK, Young A, Bibuld D, Reitz R, Salameh W, Ameri A, Tannenbaum AD (March 2008). "Vitamin D2 is as effective as vitamin D3 in maintaining circulating concentrations of 25-hydroxyvitamin D". J. Clin. Endocrinol. Metab. 93 (3): 677–81. ^ Holick MF (1987). "Photosynthesis of vitamin D in the skin: effect of environmental and life-style variables". Fed. Proc. 46 (5): 1876–82. ^ Deluca HF (January 2014). "History of the discovery of vitamin D and its active metabolites". Bonekey Rep 3: 479. ^ a b Holick MF (March 2004). "Vitamin D: importance in the prevention of cancers, type 1 diabetes, heart disease, and osteoporosis". ^ Holick MF (2011). The Vitamin D Solution: A 3-Step Strategy to Cure Our Most Common Health Problems. New York: Plume. p. 27. ^ Crissey SD, Ange KD, Jacobsen KL, Slifka KA, Bowen PE, Stacewicz-Sapuntzakis M, Langman CB, Sadler W, Kahn S, Ward A; Ange; Jacobsen; Slifka; Bowen; Stacewicz-Sapuntzakis; Langman; Sadler; Kahn; Ward (2003). "Serum concentrations of lipids, vitamin D metabolites, retinol, retinyl esters, tocopherols and selected carotenoids in twelve captive wild felid species at four zoos". The Journal of nutrition 133 (1): 160–6. ^ Hume EM, Lucas NS, Smith HH; Lucas; Smith (1927). "On the Absorption of vitamin D from the Skin". Biochemical Journal 21 (2): 362–367. ^ C. Claiborne Ray (May 17, 2005). "Sunshine Vitamin D". The New York Times. Retrieved March 8, 2013. ^ Bolton J. "UV FAQs". Info. International Ultraviolet Association. ^ Yahav S, Buffenstein R; Buffenstein (1993). "Cholecalciferol supplementation alters gut function and improves digestibility in an underground inhabitant, the naked mole rat (Heterocephalus glaber), when fed on a carrot diet". The British journal of nutrition 69 (1): 233–41. ^ Stout SD, Agarwal SC (2003). Bone loss and osteoporosis: an anthropological perspective. New York: Kluwer Academic/Plenum Publishers. ^ Institute of Medicine (US) Committee to Review Dietary Reference Intakes for Vitamin D and Calcium (2011). "8, Implications and Special Concerns". In Ross AC, Taylor CL, Yaktine AL, Del Valle HB. Dietary Reference Intakes for Calcium and Vitamin D. Washington DC: National Academies Press. ^ Walter F., PhD. Boron (2003). 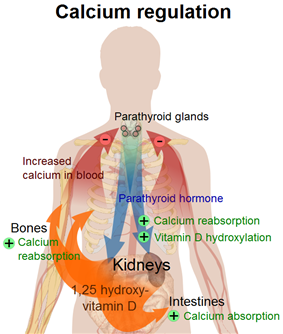 "The Parathyroid Glands and Vitamin F". Medical Physiology: A Cellular And Molecular Approaoch. Elsevier/Saunders. p. 1094. ^ Adams JS, Hewison M; Hewison (2010). "Update in Vitamin D". Journal of Clinical Endocrinology & Metabolism 95 (2): 471–8. ^ Cheng JB, Levine MA, Bell NH, Mangelsdorf DJ, Russell DW; Levine; Bell; Mangelsdorf; Russell (May 2004). "Genetic evidence that the human CYP2R1 enzyme is a key vitamin D 25-hydroxylase". Proc Natl Acad Sci U S A 101 (20): 7711–7715. ^ Laing CJ, Cooke NE (2004). "Section I: Ch. 8: Vitamin D Binding Protein". In Feldman D, Glorieux FH, Pike JW. Vitamin D 1 (2 ed.). Academic Press. pp. 117–134. ^ Bouillon R, Van Cromphaut S, Carmeliet G; Van Cromphaut; Carmeliet (2003). "Intestinal calcium absorption: Molecular vitamin D mediated mechanisms". Journal of Cellular Biochemistry 88 (2): 332–9. ^ Bell TD, Demay MB, Burnett-Bowie SA; Demay; Burnett-Bowie (April 2010). "The biology and pathology of vitamin D control in bone". Journal of Cellular Biochemistry 111 (1): 7–13. ^ Vitamin D The Physicians Desk Reference. 2006 Thompson Healthcare. ^ Puchacz E, Stumpf WE, Stachowiak EK, Stachowiak MK; Stumpf; Stachowiak; Stachowiak (February 1996). "Vitamin D increases expression of the tyrosine hydroxylase gene in adrenal medullary cells". ^ Sarkar FH, Li Y, Wang Z, Kong D; Li; Wang; Kong (2010). "The role of nutraceuticals in the regulation of Wnt and Hedgehog signaling in cancer". Cancer Metastasis Reviews 29 (3): 383–64. ^ "Hedgehog signaling and Vitamin D". Medscape.com. December 18, 2009. Retrieved March 25, 2010. ^ "Age-old children's disease back in force". Thestar.com. July 25, 2007. Retrieved August 24, 2010. ^ Elena Conis (July 24, 2006). "Fortified foods took out rickets". ^ McClean FC, Budy AM (January 28, 1964). "Vitamin A, Vitamin D, Cartilage, Bones, and Teeth". Vitamins and Hormones 21. Academic Press. pp. 51–52. ^ "History of Vitamin D". University of California at Riverside. 2011. Retrieved May 9, 2014. ^ "Adolf Windaus – Biography". Nobelprize.org. March 25, 2010. Retrieved March 25, 2010. ^ Rosenheim O, King H; King (1932). "The Ring-system of sterols and bile acids. Part II". J. Chem. Technol. Biotechnol. 51 (47): 954–7. ^ Askew FA, Bourdillon RB, Bruce HM, Callow RK, St. L. Philpot J, and Webster TA (1932). "Crystalline Vitamin D". Proceedings of the Royal Society of London. Series B, Containing Papers of a Biological Character 109 (764): 488–506. ^ Hirsch AL (2011). "Industrial aspects of vitamin D". In Feldman DJ, Pike JW, Adams JS. Vitamin D. London; Waltham, MA: Academic Press. p. 73. ^ Ziedonis AA, Mowery DC, Nelson RR, Bhaven NS (2004). Ivory tower and industrial innovation: university-industry technology transfer before and after the Bayh-Dole Act in the United States. Stanford, Calif: Stanford Business Books. pp. 39–40. ^ Marshall J (2005). Elbridge A. Stuart Founder of the Carnation Company. Kessinger Publishing. p. 235. ^ "25-hydroxy vitamin D test". MedlinePlus Medical Encyclopedia. U.S. National Library of Medicine. ^ Holick MF, DeLuca HF, Avioli LV; Deluca; Avioli (1972). "Isolation and identification of 25-hydroxycholecalciferol from human plasma". Archives of Internal Medicine 129 (1): 56–61. ^ Glerup H, Mikkelsen K, Poulsen L, Hass E, Overbeck S, Thomsen J, Charles P, Eriksen EF; Mikkelsen; Poulsen; Hass; Overbeck; Thomsen; Charles; Eriksen (February 2000). "Commonly recommended daily intake of vitamin D is not sufficient if sunlight exposure is limited". J. Intern. Med. 247 (2): 260–8. ^ "Dietary Reference Intakes Tables [Health Canada, 2005]". Retrieved July 21, 2011. ^ Salleh, A. (June 12, 2012). "Vitamin D food fortification on the table". Australian Broadcasting Corporation. ^ "Nutrient reference values for Australia and New Zealand" (PDF). National Health and Medical Research Council. September 9, 2005. Retrieved December 11, 2010. ^ "Vitamin D and Calcium: Updated Dietary Reference Intakes". Nutrition and Healthy Eating. Health Canada. Retrieved June 13, 2012. ^ Pérez-López FR, Brincat M, Erel CT, Tremollieres F, Gambacciani M, Lambrinoudaki I, Moen MH, Schenck-Gustafsson K, Vujovic S, Rozenberg S, Rees M; Brincat; Erel; Tremollieres; Gambacciani; Lambrinoudaki; Moen; Schenck-Gustafsson; Vujovic; Rozenberg; Rees (January 2012). "EMAS position statement: Vitamin D and postmenopausal health". Maturitas 71 (1): 83–8. ^ "Vitamins and minerals – Vitamin D". ^ a b Heaney RP, Holick MF; Holick (2011). "Perspective: Why the IOM Recommendations for Vitamin D are Deficient". Journal of Bone and Mineral Research 26 (3): 455–7. ^ EFSA Panel on Dietetic Products, Nutrition and Allergies (NDA) (2012). "Scientific Opinion on the Tolerable Upper Intake Level of vitamin D". EFSA Journal 10 (7): 2813. ^ Wang L, Song Y, Manson JE, Pilz S, März W, Michaëlsson K, Lundqvist A, Jassal SK, Barrett-Connor E, Zhang C, Eaton CB, May HT, Anderson JL, Sesso HD; Song; Manson; Pilz; März; Michaëlsson; Lundqvist; Jassal; Barrett-Connor; Zhang; Eaton; May; Anderson; Sesso (November 2012). "Circulating 25-hydroxy-vitamin D and risk of cardiovascular disease: a meta-analysis of prospective studies". Circ Cardiovasc Qual Outcomes 5 (6): 819–29. ^ European Food Safety Authority (EFSA) Panel on Dietetic Products, Nutrition and Allergies (NDA) (2010). "Scientific opinion on the substantiation of health claims related to vitamin D and normal function of the immune system and inflammatory response (ID 154, 159), maintenance of normal muscle function (ID 155) and maintenance of normal cardiovascular function (ID 159) pursuant to Article 13(1) of Regulation (EC) No 1924/2006". EFSA Journal 8 (2): 1468–85. ^ European Food Safety Authority (EFSA) Panel on Dietetic Products, Nutrition and Allergies (NDA) (2011). "Scientific opinion on the substantiation of a health claim related to vitamin D and risk of falling pursuant to Article 14 of Regulation (EC) No 1924/2006". EFSA Journal 9 (9): 2382–2400. ^ "Guidance for Industry: Food Labeling: Health Claims; Calcium and Osteoporosis, and Calcium, Vitamin D, and Osteoporosis". US Food and Drug Administration. May 1, 2009. ^ "Health Canada Scientific Summary on the U. S. Health Claim Regarding Calcium and Osteoporosis". Bureau of Nutritional Sciences Food Directorate, Health Products and Food Branch Health Canada. May 1, 2000. ^ "Regulatory Systems of Health Claims in Japan". Japan Consumer Affairs Agency, Food Labelling Division. June 1, 2011. ^ "Vitamin D". Nutrient Reference Values for Australia and New Zealand. Australian Ministry of Health. September 9, 2005. ^ a b "Bringing Mushrooms Out of the Dark". MSNBC. April 18, 2006. Retrieved August 6, 2007. ^ a b Keegan RJ, Lu Z, Bogusz JM, Williams JE, Holick MF; Lu; Bogusz; Williams; Holick (2013). "Photobiology of vitamin D in mushrooms and its bioavailability in humans". Dermato-Endocrinology 5 (1): 165–76. ^ Simon RR, Borzelleca JF, DeLuca HF, Weaver CM; Borzelleca; Deluca; Weaver (2013). "Safety assessment of the post-harvest treatment of button mushrooms (Agaricus bisporus) using ultraviolet light". Food and Chemical Toxicology 56: 278–89. ^ Urbain P, Singler F, Ihorst G, Biesalski HK, Bertz H; Singler; Ihorst; Biesalski; Bertz (August 2011). "Bioavailability of vitamin D₂ from UV-B-irradiated button mushrooms in healthy adults deficient in serum 25-hydroxyvitamin D: a randomized controlled trial". Eur J Clin Nutr 65 (8): 965–71. ^ Hohman EE, Martin BR, Lachcik PJ, Gordon DT, Fleet JC, Weaver CM; Martin; Lachcik; Gordon; Fleet; Weaver (March 2011). "Bioavailability and efficacy of vitamin D2 from UV-irradiated yeast in growing, vitamin D-deficient rats". J. Agric. Food Chem. 59 (6): 2341–6. ^ Koyyalamudi SR, Jeong SC, Song CH, Cho KY, Pang G; Jeong; Song; Cho; Pang (2009). "Vitamin D2 formation and bioavailability from Agaricus bisporus button mushrooms treated with ultraviolet irradiation". J Agric Food Chem 57 (8): 3351–5. ^ Duke J. "Dr. Duke's Phytochemical and Ethnobotanical Databases". U.S. Agricultural Research Service. ^ DRI, Dietary reference intakes: for calcium, phosphorus, magnesium, vitamin D, and fluoride. Washington, D.C: National Academy Press. 1997. p. 250. ^ Wang T, Bengtsson G, Kärnefelt I, Björn LO; Bengtsson; Kärnefelt; Björn (September 2001). "Provitamins and vitamins D₂and D₃in Cladina spp. over a latitudinal gradient: possible correlation with UV levels". J. Photochem. Photobiol. B, Biol. 62 (1–2): 118–22. ^ a b Holick MF (2005). "The Vitamin D Epidemic and its Health Consequences". Journal of Nutrition 135 (11): 2739S–48S. ^ Takeuchi A, Okano T, Sayamoto M, Sawamura S, Kobayashi T, Motosugi M, Yamakawa T; Okano; Sayamoto; Sawamura; Kobayashi; Motosugi; Yamakawa (1986). "Tissue distribution of 7-dehydrocholesterol, vitamin D3 and 25-hydroxyvitamin D3 in several species of fishes". Journal of nutritional science and vitaminology 32 (1): 13–22.